Located in southern Poland Pieniny National Park lies in the heart of the Pieniny Mountains. The park is located on the border with Slovakia and has a different name on the Slovak side. The Pieniny Mountains are mostly limestone and they are quite impressive as their walls head on down to the Dunajec River. The most famous summit of the Pieniny Mountains is Trzy Korony or Three Crowns but the highest mountain is Wysokie Skalki. 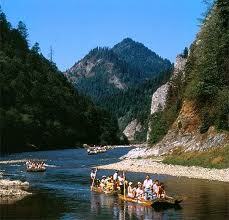 Pieniny National Park can be found in the Dunajec river basin and it was established in 1955. The park may be small but it has hundreds of plant species among which are 640 different kinds of mushrooms. If you are interested in wildlife this park has about 6500 animal species. There are many walking trails for hikers and many mountain peaks offer great views of this national park. Tourists love to take trips on the river in wooden boats. Popular species of plants are the Pieniny dandelion and the Pieniny wallflower. There are mixed beech and fir forests and barren slopes and ledges are covered with small, pine forests. Within the territory of the park are two well known castles one in Czorsztyn and the other in Niedzica. Here you can find a multitude of butterflies such as the Apollo Butterfly and the much rarer Swallowtail Butterfly. Amphibians and reptiles make their home here including the triturus, the spotted salamander, and the common European adder among others. Mammals here are mostly rodents and one can find 17 species of bats. Anyone visiting this park must go rafting down the Dunajec Gorge. The trip begins at the raft wharf in Sromowce-Katy and goes the length of 8-km to Szczawnica. There are a total of 250 rafts each taking 10 passengers and are steered by two local rafts men. The journey on the river takes from 2-3 hours. During this time you can encounter the rare black stork and other kinds of birds and animals. 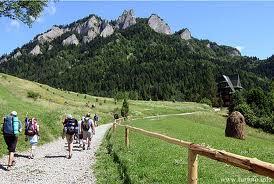 There are hiking trails throughout the Pieniny Mountains. For more relaxing activities visitors can take a look at some of the interesting old wooden churches.